Below is a transcription and sample page image for an undated register of labor contracts made in Livingston, AL. The names in the register are the names of employers who entered into contracts with Freedmen. This document is helpful because it records the names of many former slaveholders in Livingston, AL. You can sort and search the transcription table. 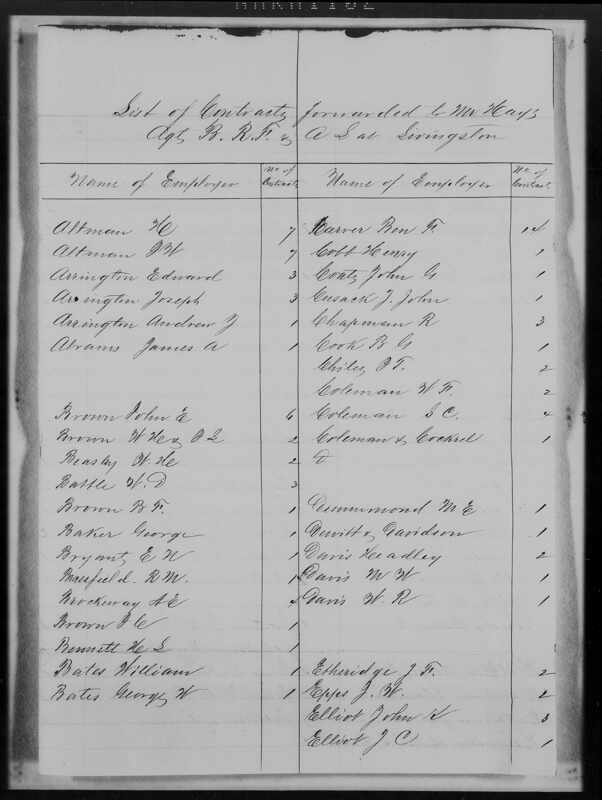 “Alabama, Freedmen’s Bureau Field Office Records, 1865-1872,” images, FamilySearch (https://familysearch.org/pal:/MM9.3.1/TH-1942-46287-1995-13?cc=2333770&wc=9GCV-T3X:1078465304,1078465307 : accessed 22 Nov 2014), Livingston > Roll 20, List of contracts > image 2 of 6; citing NARA microfilm publication M1900, National Archives and Records Administration, Washington, D.C.